Last weekend I finally had a chance to work a sound gig out in Camlachie Community Centre. It was really good show even if the audience count was low. The event featured "Borderline" and "Mike Mulligan as Roy Orbison - a tribute show". The show went well and I had good time mixing the gig. Then yesterday I got a phone call to work a show at The Stubborn on June 5th. The band is "Scott Manery and the Barnburners". This is band I have worked with a number of time before and I always have a fun time mixing sound for them. I am looking forward to gig. Then on June 10th I will be down on the Sarnia waterfront at the Dow People Place mixing a show for "Borderline" on the outdoor stage. I like working the outdoor shows when I can get one. I am actually the exclusive sound tech for "Borderline" and I have been working with them now for 5 years. Every summer they place a gig each month during the summer months at the Dow People Place and I am there for every gig. In August I mix sound for the "Hot August Nights" gig put on by the Sarnia Street Machines group. The event features "Borderline" and "The Barnburners". This event is a fundraiser where the money raised goes to purchase new hospital equipment for our local community. It is full house every year! So, as you can see I am getting more sound gigs to work at in my free time. 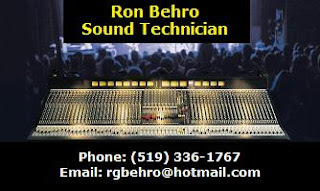 Hey, if there is anyone out there who requires a sound technician for an upcoming gig, please feel free to contact me directly. Take note of my business card below.